Whether you know them as numbergrids, nonograms, nonogrids, paint-by-number or any other name (there are dozens! ), we've got hundreds of thousands of unique puzzles here for you to solve. You can play for fun, or register a free account and compete against other players for the Numbergrid Hall of Fame! How are our puzzles different? It may sound silly to say... but each of our puzzles is actually solvable! 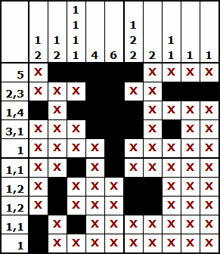 There are many online sites offering numbergrid-type puzzles, but far too many of these are computer-generated and either have multiple solutions, or they require the user to guess or use trail-and-error to complete them. Not ours - we've engineered every single puzzle on this site so that each has one unique solution, and is solvable using pure logical deduction. Guessing and trial-and-error are never required for any puzzle on this site. If you are new to numbergrid puzzles, check out this Wikipedia page for helpful background information and many helpful solving tips. Then try a small 5x5 puzzle to get your feet wet.